Teaching metalsmithing and jewelry fabrication workshops at quality locations near you. "As an art teacher myself, I have always appreciated Julie’s teaching ability. In her workshop, she fostered enthusiasm and creativity through her well-planned, comprehensive lessons. Her techniques and teaching practices guided students to continue down their own path with original results, while still following the project at hand. Students were engaged and eager due, in part, to Julie’s contagious excitement for the creative process." Julie’s experience includes teaching visual art in the classroom with a curriculum emphasis on jewelry design, leading classes and workshops at The Kalamazoo Institute of Arts, Oxbow-Summer Institute of The Chicago Institute of Arts, The Michigan Art Education Association Conference, at participating galleries, National Trade Shows and also providing artist residencies at schools and businesses. 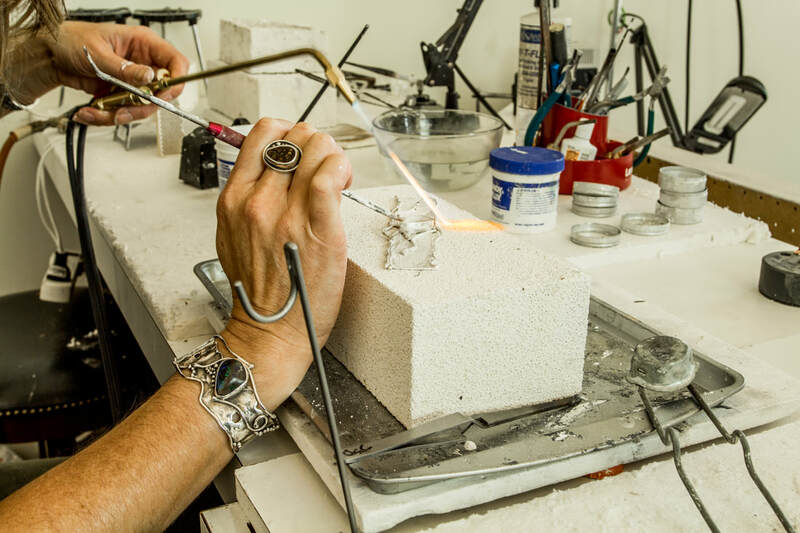 Julie is also director and primary instructor specializing in sterling jewelry fabrication at Studio JSD in Grand Haven, Michigan. Contact Julie Sanford to Schedule a workshop at your studio or event!